These were the words that Tim Cook shared that made the audience at the Apple Live event today roar with excitement. It was a justification that the rumours we hoped were true were in fact realised. It was the Apple Watch, the new product of the Apple family, and the first product created solely in the Tim Cook era. The capabilities of the Apple Watch were so numerous that Cook even said that he was unable to cover it in the 2 hour long Apple Live event. There is still time to release more information on the product, as it is only scheduled to launch early next year at an undetermined time. Apple Watch makes sure that the essence of what makes a watch isn’t lost, by retaining the look, feel, and functionality of the traditional watch. The Apple Watch’s time keeping capabilities are accurate within plus or minus 50 milliseconds, making it possibly a better time keeper than most ‘watch-like’ wearables. Instead, it found its inspiration from the original look of the watch, and transformed a classic part of a traditional watch – the crown – into a navigational tool and home button and called it the ‘digital crown’. It allows you to scroll through lists, zoom in on a map or picture, or flip through various apps. 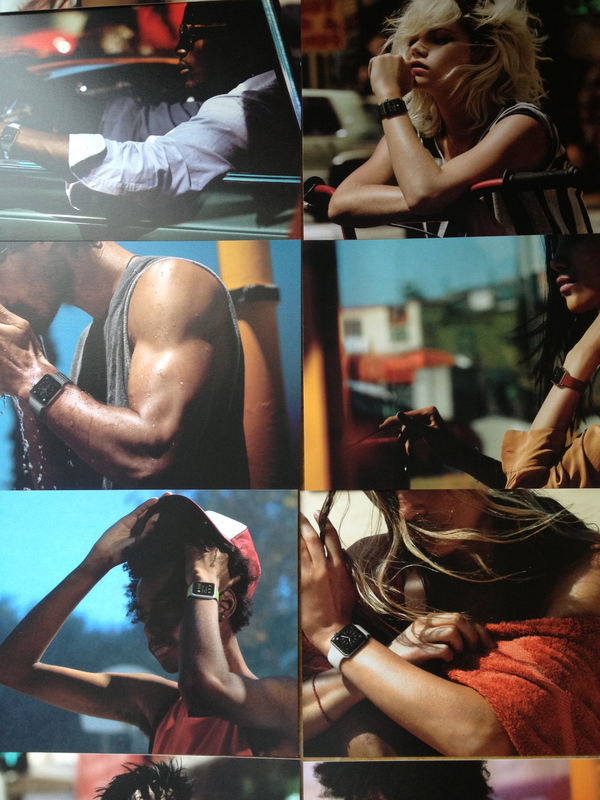 The Apple Watch expects you to use it like a real watch, like lifting your wrist up to look at the time. When, and only when, you do this, it will detect your movement and turn your screen on to show the time for you. The Apple Watch looks gorgeous. It comes in two sizes, 38mm screen and a 42mm screen, and has three different versions – the Apple Watch, the Apple Watch Sport, and the Apple Watch Edition. While the Apple Watch comes in a stainless steel frame, the Apple Watch Sport comes in an aluminum cases with silver and space-grey colours. 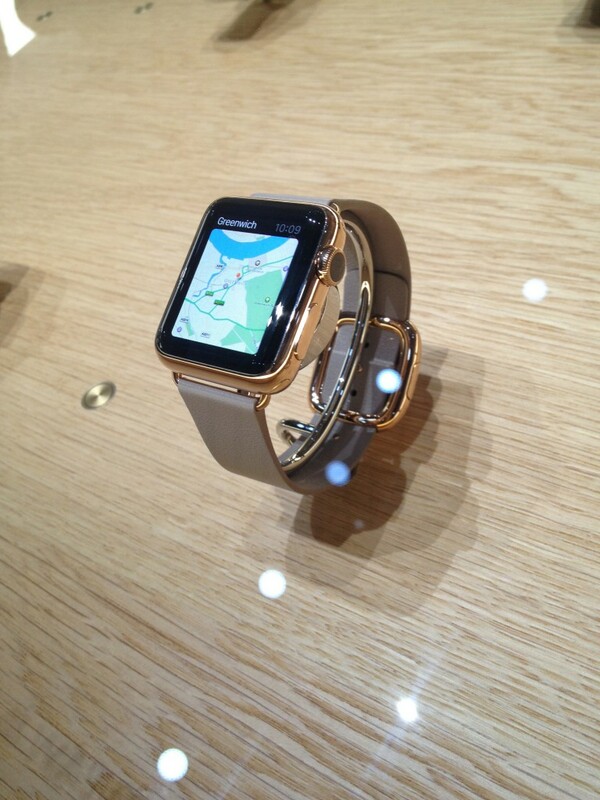 The Apple Edition takes the fashionable route with a gold and rose-gold case. There are also 6 different types straps to choose from – the Sport, Classic Buckle, Milanese Loop, Modern Buckle, Loop, and Steel Link – all in different colours. With the vast amounts of looks that you can customise, by case or strap, it’s so much easier to integrate this smartwatch into your everyday life. It seems that Apple was aiming to make you want the watch not just for its functionality as a tech wearable, but also as the accessory that it always has been. 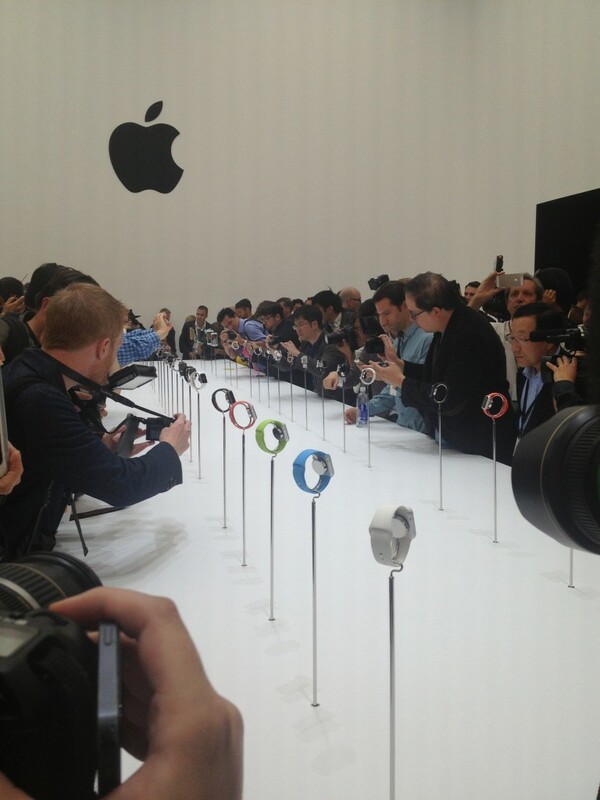 Even the watch faces are customisable to your own preference, down to its type, colour, and image. Interestingly, it is able to show you where you are on a globe, zoom out onto the moon, or even zoom out even further to see the whole solar system. There’s even a classic mickey mouse clockface, if you’re feeling nostalgic. The Apple Watch is able to recieve messages, and even reply to them instantly if you want to. By recognizing what is in the incoming text, the Apple Watch will come up with suggested replies so you only need to tap to answer. For example, if your friend texts you to ask if you want to have Sushi or Noodles for dinner, it will instantly suggest “Sushi”, “Noodles”, or “I don’t know”. The Apple Watch is able to store all your contacts, and you would be able to tap on your friend’s picture to phone or text them. Touch the center of the picture and it will show you a blank black space where you can draw or tap. If you tap the screen with three fingers, the other person who is also wearing the Apple Watch can feel it, almost like you are literally tapping on his wrist with three fingers. You can also draw pictures on the screen and they would be able to see it what you are drawing on your Watch. If you’re feeling specially intimate, you can also share your heart beat. If you’re trying to find out how to walk from point A to point B, simply open up the Maps app in Apple Watch and map your route as usual. Then, they will not only give you visible directions, but also vibrate against your skin to tell you which direction to go. It’s almost like an invisible guide, where you won’t even need to look at your watch or phone – just walk and trust Apple Watch to guide you. 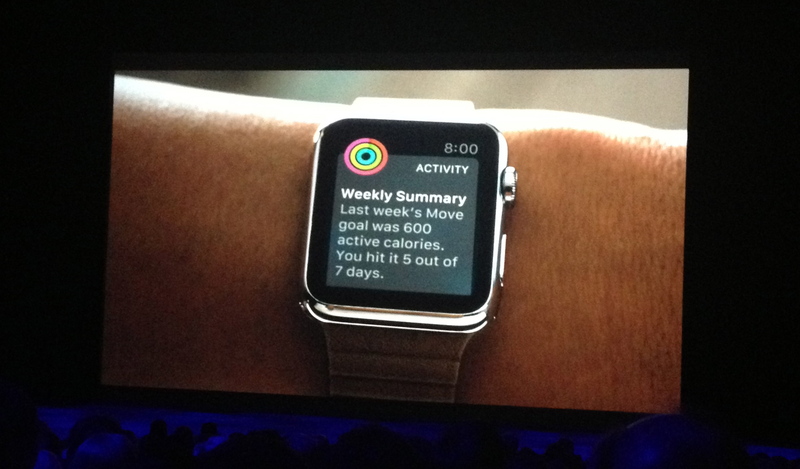 As Tim Cook described it, Apple Watch is also a “comprehensive health and fitness device”. There are two apps that help motivate you to be more healthy. The Activity app uses the accelerometer to track movements, calories, and even time spent standing throughout the day, and gives you a full overview of the quality of your health and exercise. The Workout App operates with a few simple circles – each representing goals that you are setting for yourself. Completing goals will give you a full circle, and even help you earn awards. 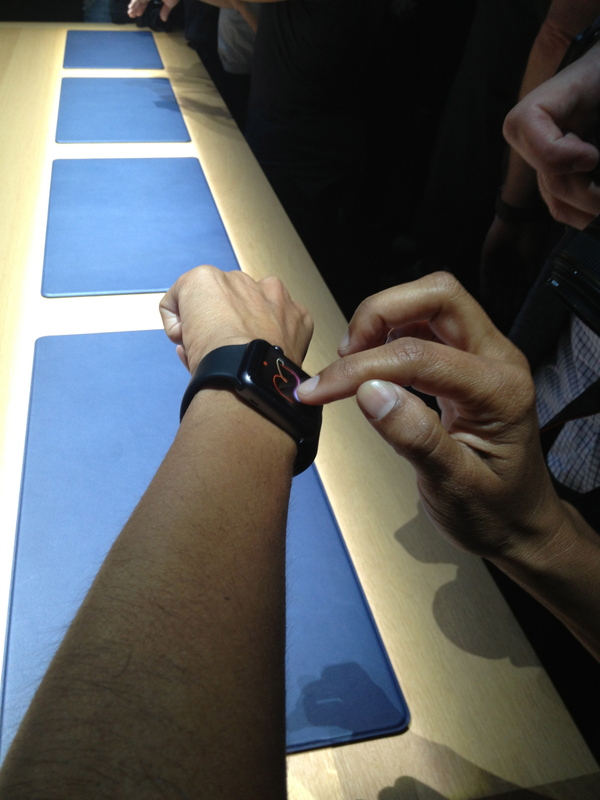 The Apple Watch also includes a NFC chip that allows you to pay simply by tapping your watch. The next time you buy your coffee at Starbucks, you won’t even need to touch your wallet. It works together with the iPhone 5, iPhone 5S, iPhone 5C, iPhone 6, and iPhone 6Plus. 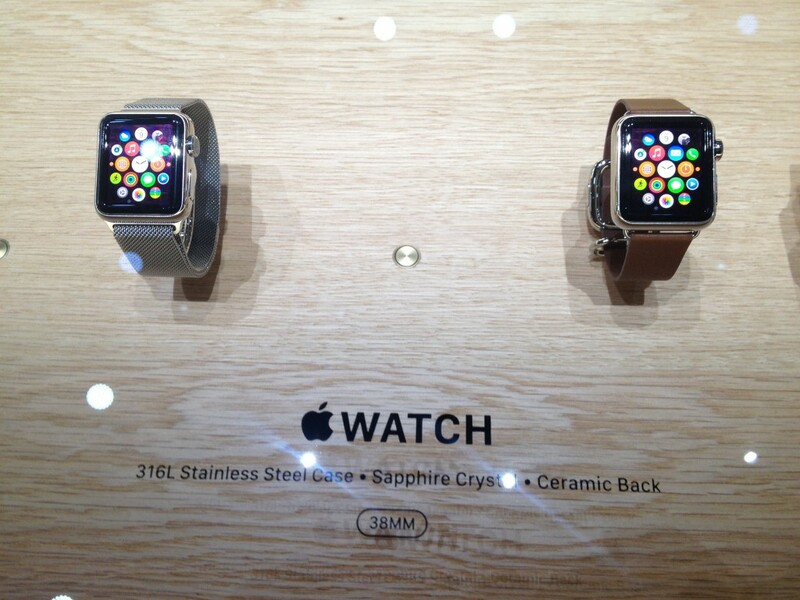 While the pre-event rumours called this wearable the iWatch, Apple Watch definitely sounds much better. The use of a wearable at this level opens up many doors, and the customizability and a fashionable aspect makes it easier for anyone to begin using it, lowering the barrier that separated technology-savvy people to include your everyday tech user. Technology is becoming less of a unreachable and exclusive world as it integrates into other worlds – Fitness, Health, and Fashion. The Apple Pay capability also opens more doors. According to Cook, he uses his Apple Watch to navigate his Apple TV. Starwoods Hotel allows you to unlock your door with your Apple Watch. BMW lets you track your car’s statistics, like fuel or battery levels, and even find your car in a parking lot. Some people use it as a walkie talkie or a viewfinder for their iPhone. Apple is also planning to release the necessary code to developers, so that more people can begin making apps for the Apple Watch, thus transforming the way you live your life now. Who knows? In a couple of years we might be more reliant on our smartwatches instead, even end the era of smartphones as we know it. And that future almost looks visible with the Apple Watch launch. The biggest worry at this stage is the durability of the watch. As the first of its kind, we would expect some kinks and some mishaps in its first batch. 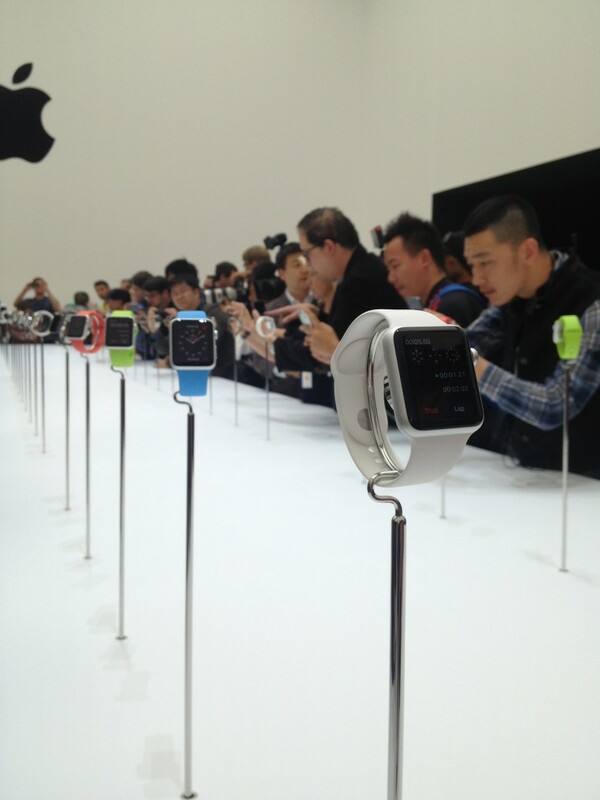 But that also means that the Apple Watch can only get better, while the other wearables catch up to their technology. 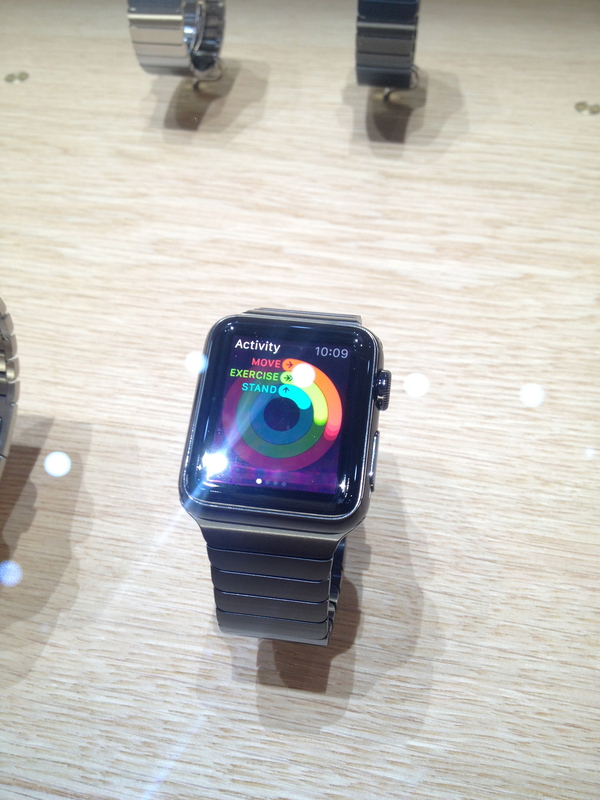 It is uncertain how the Apple Watch apps will be sold, or how many will be available. Would it be possible to play games on your Apple Watch? What else is it capable of? So many questions, and too much time before its release to speculate.